Our first Guest Editor Steph Blom, weaves her stories together here in her last post with us. It has been a lovely and gentle beginning to our series and I have really enjoyed the opportunity to work with Steph. Do take the time to follow her work on her blog here and share your thoughts on her weavings, words and ideas in the comments below. Steph writes: This piece was made in a way as a reflection on the meetings I had for this project, the people and their words and thoughts shared with me, the impressions that this all left on me. It is made slowly, over the span of a few weeks. 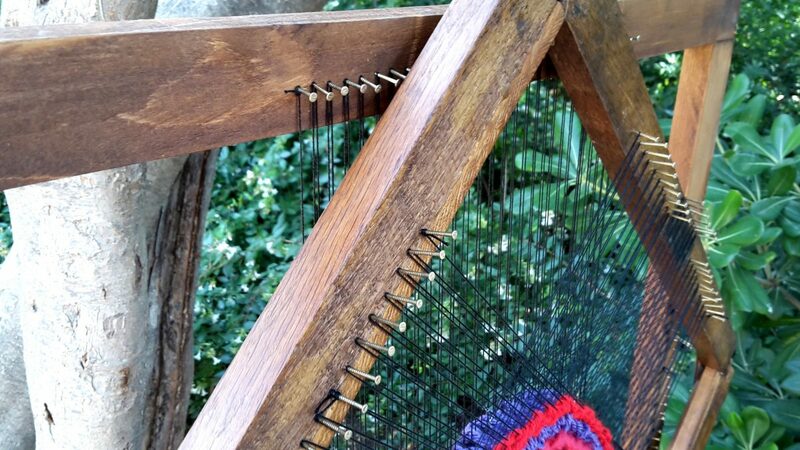 It started with the idea of creating a sort of double loom, with the possibility to weave one connecting piece on multiple levels. 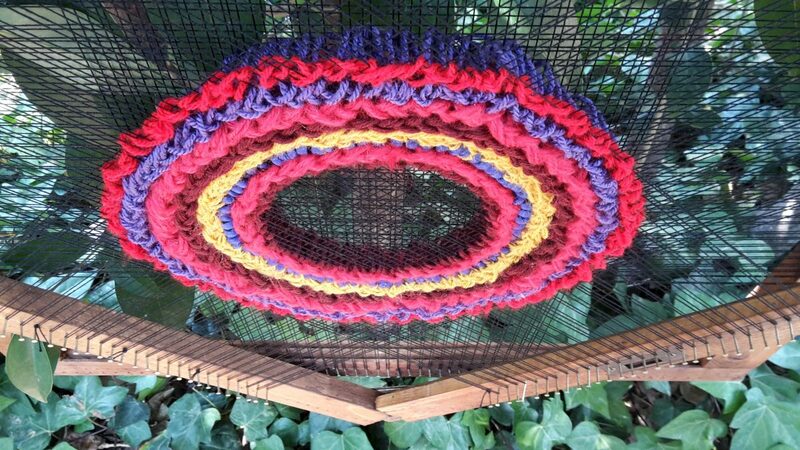 Materials are wood that I found near the garbage on the streets, nails and a mix of wools/fabric. While it is made out of 2 separate frames, one leans on the other, together they form an 8 pointed star and the threads of the circle connect the two parts, encircling the center, the 9th point if you wish. When we connect with another, each person has its own ‘form’, and connecting shows the simultaneous presence of duality and oneness. The reflection and recognition of oneself in the other, of having a different form but essentially being part of the same. 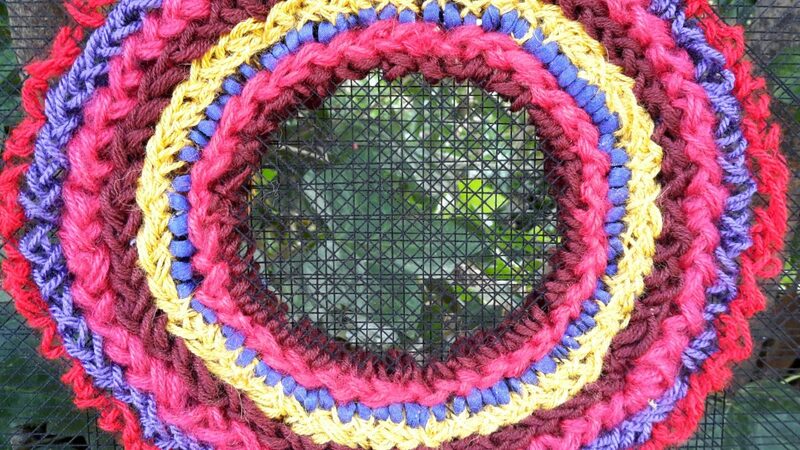 First I thought I would fill up the circle, weaving until I reached the middle. However, at some point I felt ‘this is it, it’s done’. The center is present while at the same time it is empty and you can see through it, it is defined by the form around it. Had I filled it up, you would not have been able to see it. Like the container and the contained, what is inside –the contained, the center- appears to the outside in the representation of a form. As our bodies are our form, our essence could be considered to be our center. Maybe this essence is what we can feel when we connect to our inner self, and also when we truly connect with another.